There is a huge number of amazing data journalism projects out there. In this list I’ve collected ten interesting projects that look very inspiring to me from multiple points of view. 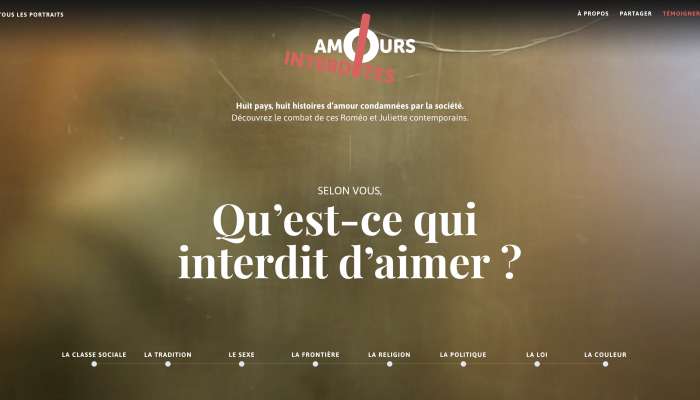 Awesome use of animations, including a great horizontal scroll and 3D visualization. 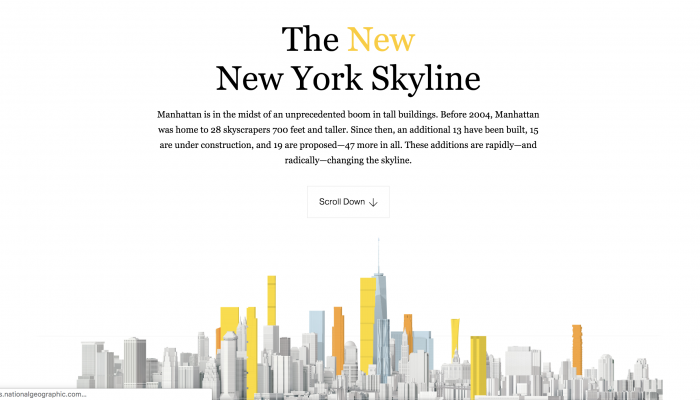 This is a very clean interface with a great UX to visualize the NY evolving skyline. Astonishing work. Fantastic cross-border data-driven longform project on contraceptives across the world. 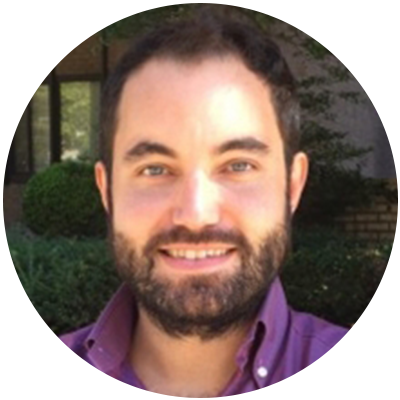 It received the Data Journalism Awards and covered the topic with an innovative format and a transnational effort, exploring the intersection between sexual health and religions. 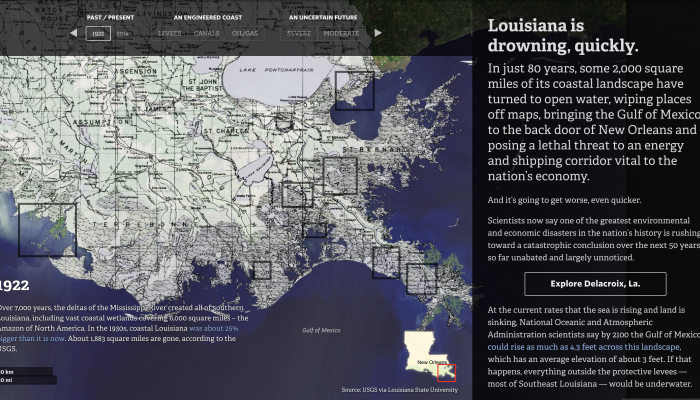 Excellent combination of satellite images and interactive timelines to visualize the impact of climate change in Louisiana, USA. The overall interface is complex but the user manages to travel across the affected piece of land. Very informative. What do you call a person who moves to another country in search of a better life? Text-mining data journalism project with a clever gamification component. 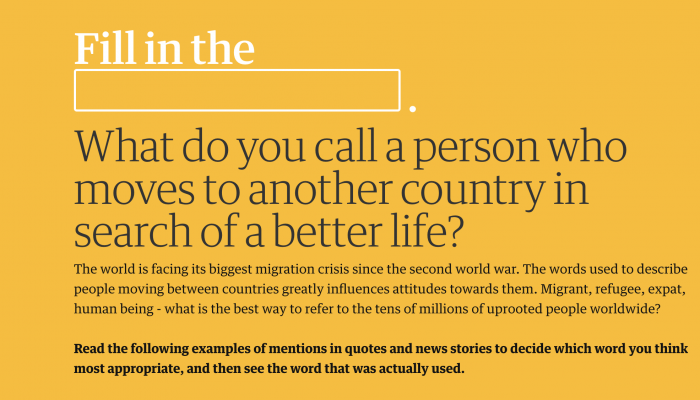 It includes a quiz to show how politicians, activists and other players refer to people known as ‘migrants’. It shows how a word can be weaponized. this documentary by Arte is bittersweet: the stories of the modern ‘Romeos and Juliets’ who love each other but are not allowed by society to do so. That can happen because of religion, borders, politics or other social rules. Eight short and accordingly labelled episodes will let you travel across the world of forbidden love. 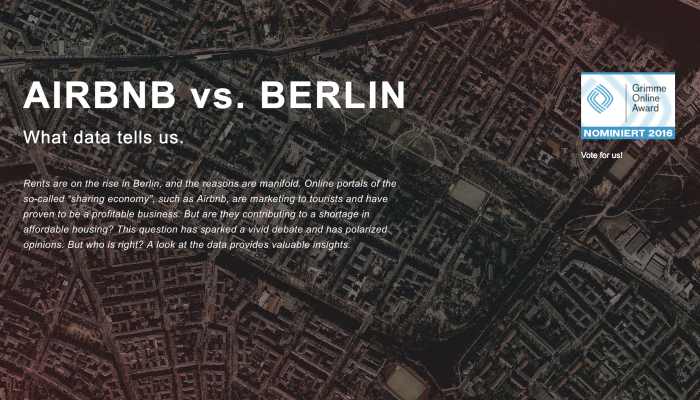 Cool series of interactive data visualizations about the impact of Airbnb on Berlin. It’s an inspiring data journalism project investigating the effects of gentrification in growing cities like Berlin. this NYTimes project uses text mining and social media analysis to analyse Donald Trump’s toxic speech on Twitter. 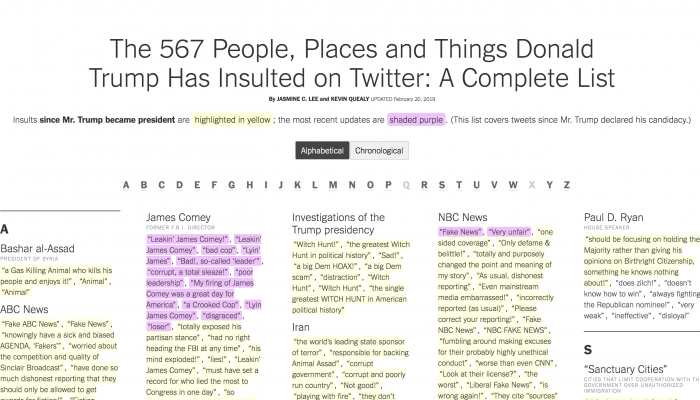 Clever use of Named Entity Recognition and colors schemes and interesting statistics around the use of the presidential Twitter account. 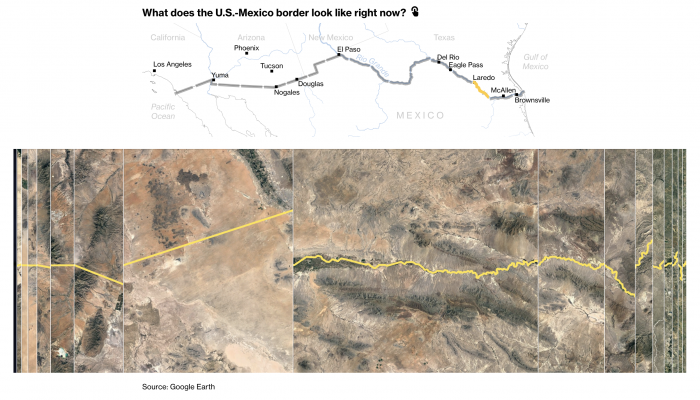 Useful data-driven explainer describing the nature of the Trump’s project of the wall on the US-Mexico border. 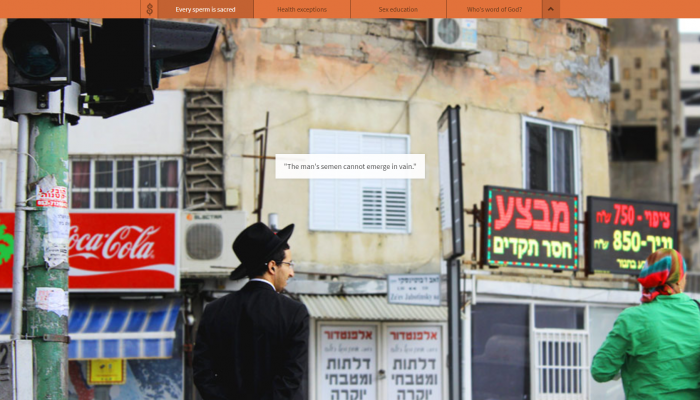 The interactive piece analyses the projects from multiple points of view. I particularly like the combination of the horizontal image-slide using satellite images connected to a clean interactive map. 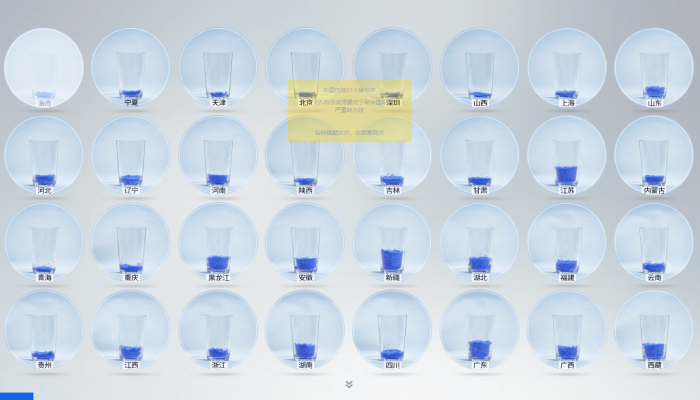 Cool Chinese data journalism project combining interactive visualizations and animations about the amount of water China has and consumes. Hard to read if you don’t speak Chinese (but you can use Google Translate! ), what I like of it is the topic and the design. Also, the maps of China are beautiful. This is an interesting data-driven political analysis by La Nación Data from Argentina. 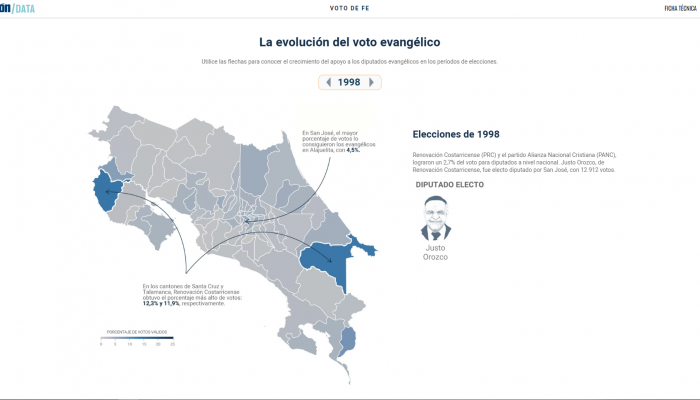 By combining time-series of dataviz, maps and proper election data, the author shows the surge of evangelical candidates elected in the Argentinian political landscape and the impact of religion on it. The illustrations are also nice.